Engineers create prototypes before manufacturing final products, and architects build maquettes prior to any actual construction. What if patients and dental practitioners could see the final result of aesthetic restorations before performing a treatment? At their state-of-the-art dental practice in Las Palmas de Gran Canaria, Canary Islands, Spain, Pablo Ramírez and his brother Alejandro have pioneered Digital Smile Design, a tool that helps patients envision their treatments ahead of any procedure. By embracing a digital workflow and desktop stereolithography (SLA) 3D printing, the brothers have managed to simplify and speed up the process of creating temporary mockups, mitigate risks before the procedure, and truly bring a smile to their patients’ faces. We talked to Pablo to find out more about the practice's innovative smile dentistry workflow and implementation of digital technologies to improve efficiency and patient experience. Digital Smile Design (DSD), invented by Brazilian dentist Christian Coachman in 2007, is a versatile dental treatment planning tool used to strengthen diagnostic vision, improve communication, and enhance predictability throughout treatment. Watch this video for a visual walkthrough of an end-to-end Digital Smile Design treatment. Treatment plans are based on the analysis of the patient’s facial and dental proportions. Temporary mockups, photographs, and videos help practitioners understand the relationship that the mouth, teeth, gums, lips, and smile have with the facial features in motion and with emotion. In the end, the Digital Smile Design process helps both the patient and the dental specialist. Patients are delighted to see the outcome, and it gives them confidence in the treatment. It’s a great communication tool-–patients are much more likely to commit to the actual procedure when they can foresee the results. DSD is also beneficial for diagnostics and treatment planning because it shows how much movement of teeth is feasible using aligners, which allows practitioners to choose the least invasive restorative treatment that fulfills the patient’s aesthetic requirements. What does the Digital Smile Design workflow look like? The DSD process starts with a digital scan of the patient’s dentition, which we take with an intraoral scanner. Then we import the data into the software (DSD Nemo), where we have a digital library of different shapes and forms that we can use to overlap the teeth for the given aesthetic procedure. 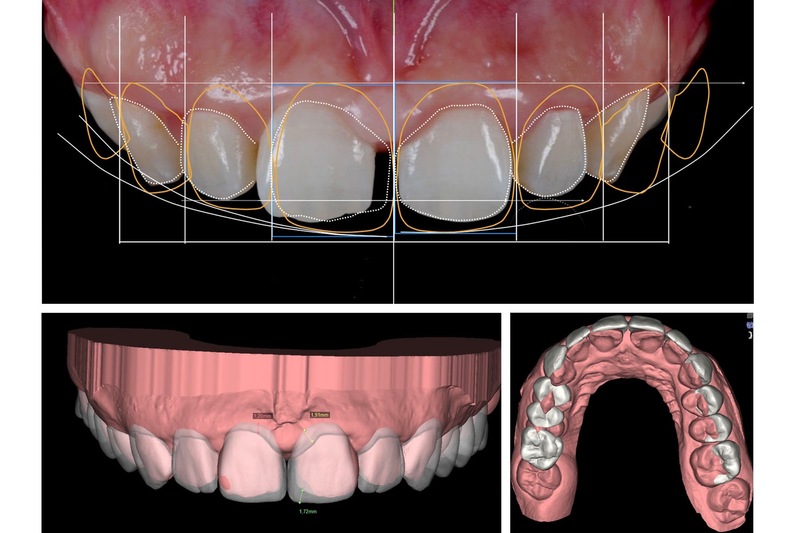 Practitioners use a digital library of different shapes and forms provided in DSD NEMO software to overlap teeth for a given aesthetic procedure. Next, we print the model on the Form 2, clean it, and cure it. We then place the model in a silicone index, which creates a negative of the teeth within the index. Then we use a thin layer of temporary acrylic to form the teeth directly in patient’s mouth. Normally, you could see layer lines on the teeth if you look close enough, but with the new Standard Grey and White Resin, it’s completely flawless and highly detailed. 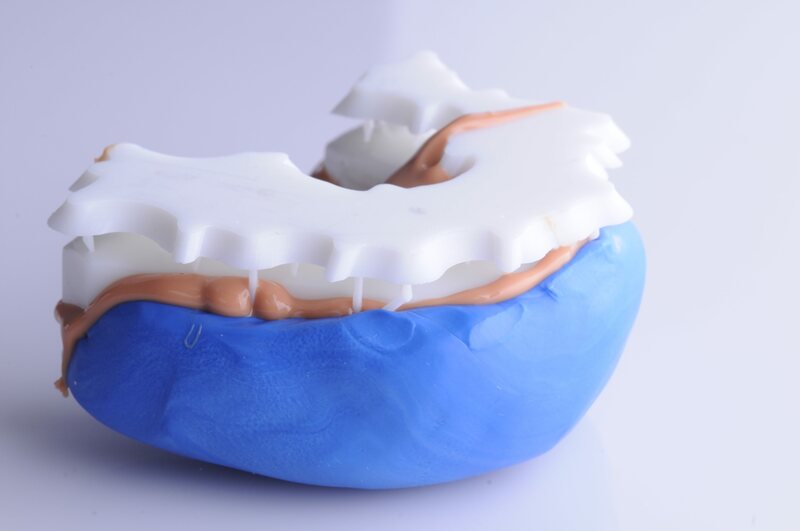 The 3D printed dental model overlapped with the restorations is placed in a silicone index to create a negative of the teeth. With the traditional analog method, the practioner would take a regular impression from the patient and send it to a dental technician who would start adding wax over the stone model, drop by drop, tooth by tooth. During the appointment with the patient, we use the silicone index to carefully place the temporary mockup in the mouth. Then we take photographs and videos of the patient from different angles and in motion so that they can evaluate the look of their teeth and their future smile, and we can make adjustments if necessary. How has the digital workflow and 3D printing changed the DSD process? Smile design is a key step to analyze the aesthetic potential of a dental treatment, following the biological and restorative principles, and for many years it has been done in an analog way. You’d take a regular impression from the patient and send it to a dental technician who would start adding wax over the stone model, drop by drop, tooth by tooth. It would take at least one week or more like ten days to receive the wax-up. A temporary mockup is placed into the patient’s mouth. With 3D printing, the time in between the first visit and the treatment plan presentation is reduced from weeks to a few days. With the digital process, I can scan the patient on the first visit, plan the case, and schedule an appointment for the treatment plan presentation with the patient within the next few days. The final wax-up will be ready for the mock-up and photo or video shoot. Patients’ expectations are high, and timing is a key factor for most of them. The digital process breaks down this time barrier, simplifies the workflow, and saves on costs. What does the actual procedure look like? Each case has to be evaluated individually; treatment planning with the clinical team is the first step in all the dental treatments. Dentistry is moving into minimally invasive procedures; clear aligners for controlled movements of the teeth and aesthetic restorations for final smile enhancement are very popular procedures today. Let’s say we do veneers. In some cases, there’s a need to do major preparation on the teeth before, combining clear aligners and restorative procedures. We choose the final “stop” of the tooth movement to have the ideal biological and prosthetic tooth position. Then we take a new digital intraoral impression, match the teeth, and overlap them with the design that we agreed on with the patient previously during smile planning. We send the digital files to the dental lab that mills and finishes the veneers for final bonding in patient’s mouth. Before the procedure, we check the final restorations on dental models, which is where 3D printing and the new Dental Model Resin come in. With the final restorations in hand, we will print a model to double check the fit. Normally for a single crown or veneer, there’s no need since you have room to adapt. However, if you're doing multiple restorations, you will need a model because some minor adjustments always have to be done to achieve the perfect aesthetics. How do you see dentistry changing in the future? I believe that in the future more and more workflows will be digital. Digital planning with overlapping files, 3D printing, and facial scanning will be routine practices in dentistry sooner than we think. Technology is moving fast and the increasing range of dental treatments supported with smart technology will provide a lot of benefits to our patients. At my private practice, I still decide on a case-by-case basis when to go for the full digital or a mixed digital/traditional route depending on the dental treatment that has to be done. Some digital workflows are new and, initially, you’re afraid to take the risk in your private practice. You have to take this leap of faith, but as digital solutions are becoming more accurate and reliable, it’s getting easier. Before these digital tools, you’d need to handcraft the wax-ups and final restorations, and, in some cases, work extensively with powders or liquids to achieve aesthetic ceramics. Now milling machines, software, and 3D printers take over tasks that used to require complex skills and craftsmanship. Digitally trained technicians and dentists are becoming the standard nowadays, and their collaboration is a must in order to achieve the best results. But even though technology has changed our daily workflow and is here to stay, the basic principles like respecting biology and treatment planning will always be crucial in dentistry. Find out how you can implement 3D printing into your workflow, see Formlabs’ growing range of Dental Resins and get a sample part.